You can’t get it at Joann or Michaels, or, to my knowledge, Hobby Lobby. I had to drive into town and go to the art store to get it. Or you can order it online (like the link above). And while I love that there are 3 art supply stores here that carry it, I’m scared to go in those stores. Like I feel like they’re for “real” artists and I’m some kind of poser who will be immediately detected and thrown out. Well, my trip was perfectly easy and pleasant, and I didn’t detect any cynical staff members looking down their noses at me. Fear #1, completely unfounded. 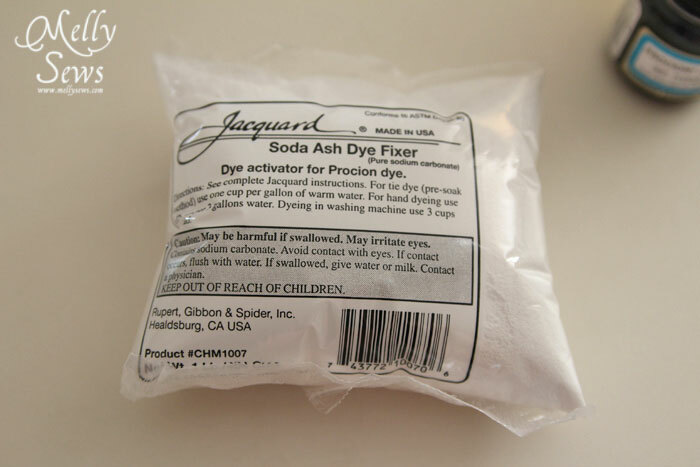 You have to use soda ash to set the dye, and I feared this would be caustic and awful to handle and create terrible fumes. Oh, and also expensive. Well, I looked it up, and the greatest risk seemed to be storing it mixed with water, which I didn’t, or letting it touch your hands because it’s a skin irritant. So I wore gloves, which I wear anyways when dyeing. Also it’s cheap and easy to handle and use. Fear #2 unfounded. I thought it would be ridiculously expensive. Truth: I spent a total of $28 on the supplies. Yes, that is a little pricey. But I only used about $4 worth of those supplies; the rest I have left over for next time (the priciest thing was the detergent at $19.99 because they didn’t have smaller sizes; I’m not sure you have to have that, but since it was my first time I followed directions to the letter). A bottle of RIT is $3.99. And that’s if I only use one bottle. With the ombre dress I went through 4 bottles by the time I was done. So in reality, this isn’t any more expensive, and I like the results so much better. Fear #3 busted. I thought the process would be time consuming and complicated. I had this vision of high school chemistry lab and things blowing up. It isn’t at all like that. Especially when you compare to the ridiculous process I went through to get the ombre dress to a color I don’t even love. Fill a tub with hot tap water and add a whole bunch of salt. Add the required amount of dye. Put in your prewashed and wet item to dye. Stir occasionally. After 20 min, add soda ash. Keep stirring occasionally for 50 more minutes. Rinse and wash.
See? It’s really nothing to be scared of. I have no idea why it took me so long! And I will not be going back to RIT dyes now. And here’s my dye set up: I use a big plastic storage tub set in my bathtub. I mix the dye and hot water in it, then when I’m done I dump into the bathtub to drain and rinse. I have an acrylic tub, and it’s important to rinse quickly or the dye kind of stains my tub, but it’s nothing I haven’t been able to get off with a little bleach later. One thing I had trouble finding online is how much dye 2/3 oz. (the jar size) will dye. 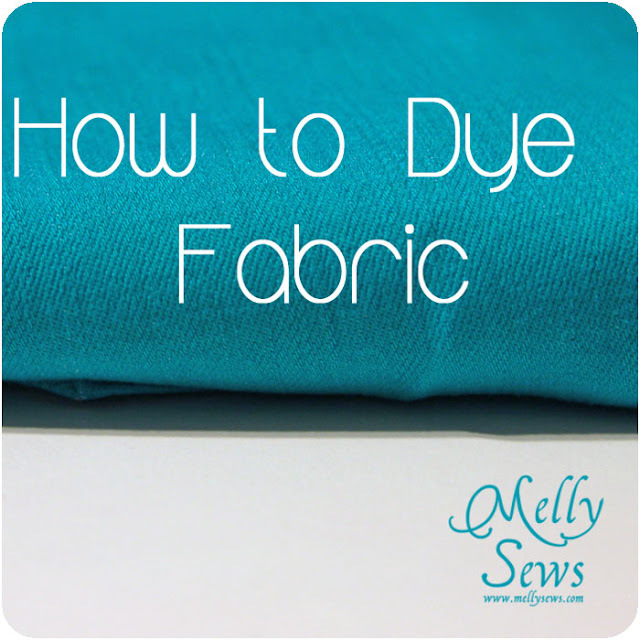 With most colors, it will do two and a half 3 gallon dye baths (a 3 gallon bath should dye 1 lb of dry fabric). Some colors need twice the amount of dye, so a jar will only do a little more than 1 dye bath. (Update: the Dharma dyes come with more dye in a jar than this. Just order one jar and you should be fine for a couple items of clothing in that color). This is a super useful post. Thanks for allaying the fears of the rest of us. And for teasing us with the ‘oh it was too dark to take pictures line’. I’ll be back tomorrow to see what you’ve done with this! That color is vibrant! I’ve never dies (aside from koolaid dyeing yarn), but I really want to try. I love the colour of your last item ( looks like jeans to me)! I would also recommend using thiox to remove color rather than bleach, since bleach is sooooo caustic to your fibers – it actually will keep eating your jeans even after you have rinsed them, 3-4 washes from now you could pull them out of the dryer a holey mess because the fibers keep breaking down. 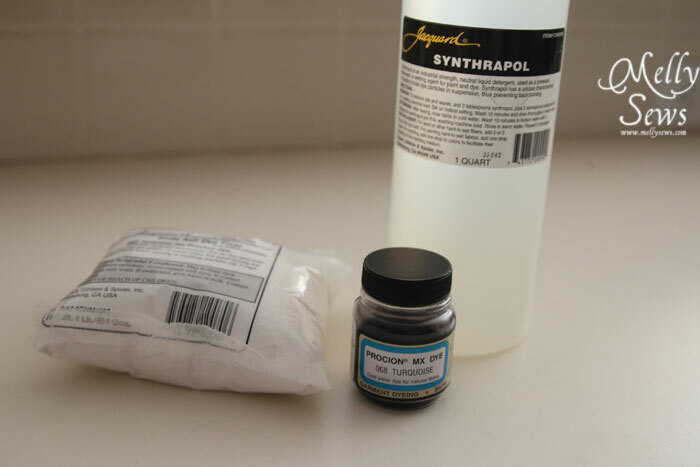 You can hopefully counter this a little bit buy neutralizing the bleached item in white vinegar (obviously after it has been rinsed)But Thiox removes the color with MUCH less damage to the clothes, and since you have started mixing your own dyes etc. it isn’t a very far leap! OH! and always wear a mask, and never breathe in the powder or do anything near food (I actually have special dye utensils marked so they can’t ever get mixed up with the food ones even when clean) because you can actually develop a terrible toxic allergy to the dyes, that once you get it, you will never be able to work with dyes again, and black lung is not fun for anyone! (safety was the most important part of my surface design classes at school, you could get your booty kicked out of the dye room faster than you could say boo if you weren’t following protocol.) We had to do everything under an acrylic hood when the dye was in powder form, and you always place down wet paper towels to trap any of the dust, you always suspend the dye powder in a small amount of water before taking it out from under the hood so that you couldn’t get the dust into the air. all it takes is one piece of dye dust to land on a piece of wet anything, and you will dye it, so beyond safety, it’s also a contamination issue! I too had dyeing issues using Rit (for the white sheet challenge) – my sister made me promise that next time I will get ‘real’ dye… all the steps and soda ash scare me too, nice to see all teh fears debunked ;o) I am also already in love with the undisclosed outfit!!! 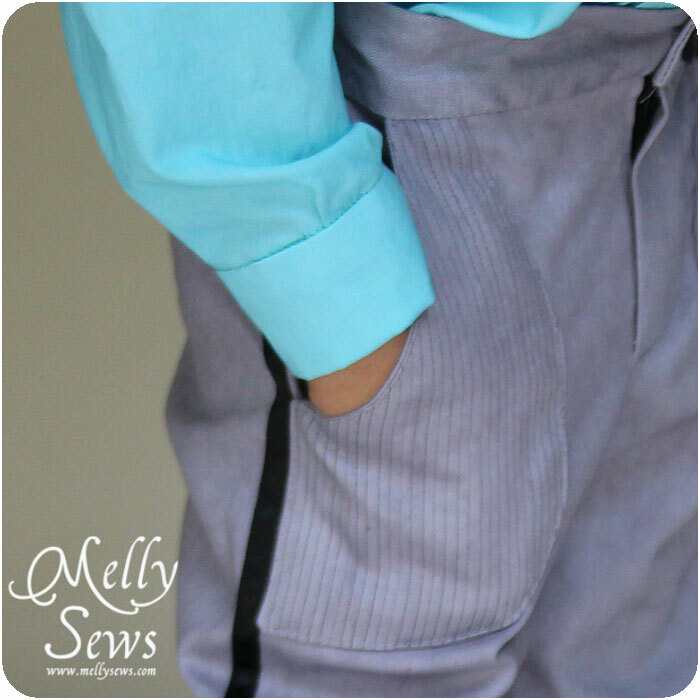 Grey, teal, pinstripes, tuxedo stripe…. gahhhhh, I just know it will be another brilliant design! You have inspired me with the clear plastic tub you used. I dyed a skirt with rit dye a few weeks ago and wasn’t particularly impressed with the process and expense. 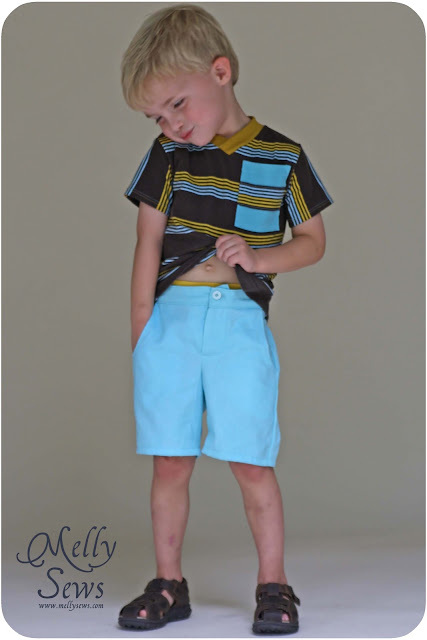 I would love to play around with mixing colors to get something I love in a color I love! Wondered if a brown would cover stains??? Personally, I wouldn’t try carpet. And this particular dye wouldn’t work for wool, either. 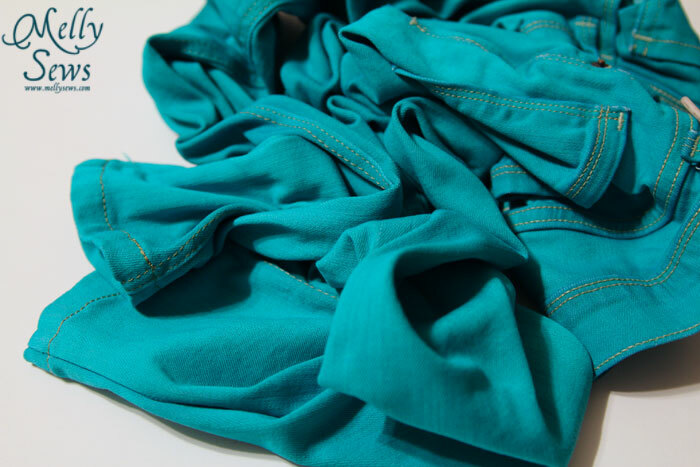 Wool fibers are protein based, not cellulose based like plant fibers (cotton) so you need a different kind of dye. I’m looking to dye a white lace dress that is 51% cotton, 46% Nylon and 3% spandex…I have never done much dying and I have a white dress and would like it champagne, tan, beige any suggestions before I start I’m hoping not to rune my $60.00 dress. When I was a student I bought a set of procion mx dyes, they are great and last ages. After a bit of research I found that washing soda was the same chemical as soda ash and I could get it from the supermarket. I got excellent results every time. Must buy some more. Yes, go cheap and get the arm and hammer washing soda and dawn liquid. I dye a little differently, putting my fabric in the soda ash with water to soak a while then just putting it in a plastic container and swishing it around in the dye a few minutes. I then squeeze it out, get rid of the little bit of dye left, and leave it in the the covered plastic container for 24 hours on top of my warm fridge. Worked great and was easy.